SA/DA. Compact frame. Elongated cylinder handles .410 shotshells & .45 Colt. Steel construction. Smooth trigger pull. Ribber Grip®. Transfer bar safety. Fixed red fiber-optic front fixed rear sights. Yoke detent. Taurus® Security System. Unlimited Lifetime Repair Policy. Wt. : 29 oz. Standard duo-tone. 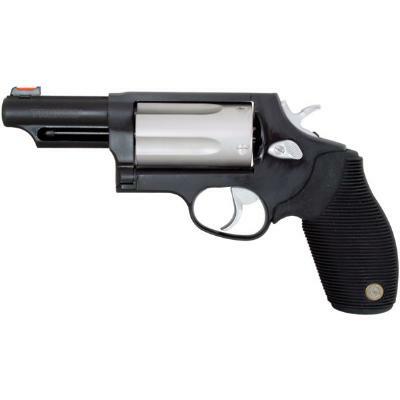 .45/.410 3″ Mag., Cap. : 5, 3″ barrel.